When we launched Casual Runner, we did so with the idea of providing runners with a voice for sharing their personal experiences and opinions. In so doing, we created a platform where fellow runners can learn from the experiences of their peers and enhance their own Casual Running adventures. This is perhaps most important when it comes to committing yourself (and your budget) to selecting races, especially given the significant investment of money, time, and training that goes along with committing to a race. Our race reviews provide a snapshot of runners’ experiences at many events. It is also important to note that not every Casual Runner will have the same experience at the same event. This is why, at times, our Team has very differ opinions of the same race, and it is important to us that we share these opinions with our readers – all of them. 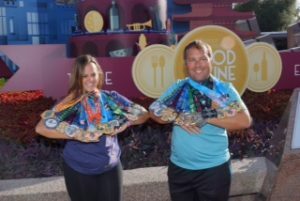 It is time to share my final thoughts on the changes that runDisney made to this year’s Wine and Dine event from previous years. As events continue to evolve over time, it is important for runners and race directors alike to take stock of what worked, what did not, and what areas of improvement are out there that can help make great events even better. It is for this reason that, when it comes to great races, runners can run the same event multiple times and yet get a very different experiences each time. 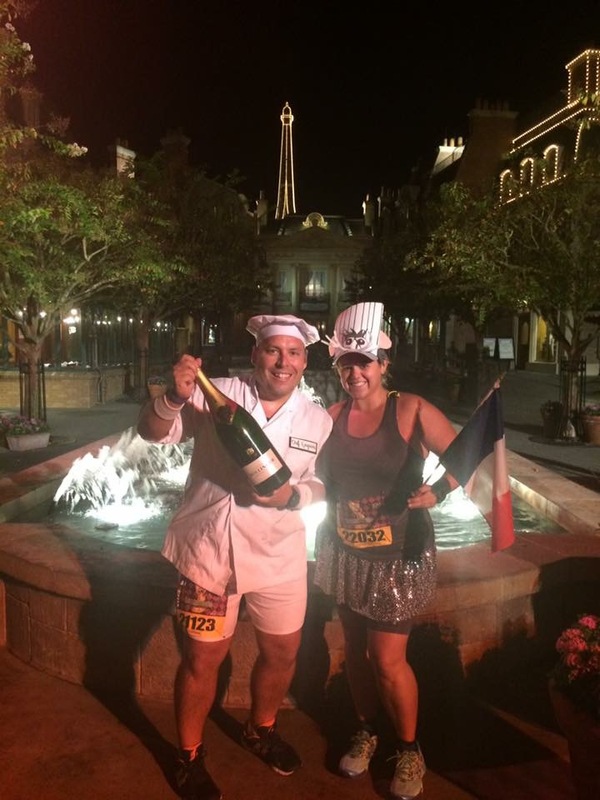 So, here we go with the HITS & MISSES of the 2016 runDisney Wine and Dine Half Marathon Weekend! Let’s start with the biggest, and worst, change for this year’s event. Moving the Half Marathon from a night race to a morning race was a bad move. It changed everything about the weekend, and not for the better. First, runners lost the opportunity to run Walt Disney World at night, and the half marathon became “just another” race, as every other runDisney race is held in the early morning hours. We acknowledge that some runners like this change, but, as we said before, if you prefer morning races, you have literally every other runDisney race that fits your preference. 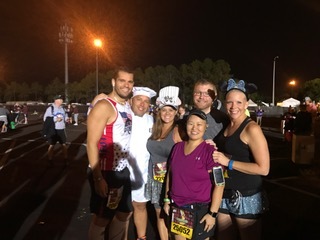 Is it too much to ask runDisney to give us one night race a year? I think not. And, to be honest, unless this race goes back to a night race, I do not see myself running it again. So, please, runDisney, bring back the night! We knew the time change would impact the post-race party, and it did. Going into the weekend, we felt like the post-race party lost all of its appeal as it essentially turned into Extra Magic Hours. We went to the party, but left early, seeing no real reason to stay (the appeal of sleep was, well, more appealing). Lines at the food kiosks were long, and while some attraction lines were walk-on, the headliner attraction, Frozen Ever After, had wait times equal to or in excess of what they were the entire time we were at Walt Disney World. Additionally, as the party did not start until more than 12 hours after most runners had finished, it lost its excitement. Wow. I have never seen such long lines to get into a Disney party. 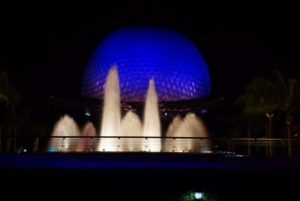 As Annual Passholders, we entered Epcot before the post-race party tickets became active. We made a point to check out the lines and found literally hundreds of people waiting in line inside the park for wristbands and thousands more lined up to enter the park at the appointed time. We also spoke to several readers who noted that, at the party, there were many party crashers who did not have party wristbands but were nonetheless hanging out and adding to the crowds. The addition of the Wine and Dine 10K to the race program is a good one as it affords more runners the opportunity to participate. While the race itself needs a lot of work, it is nonetheless a good addition to the race program. Oh, and I love that they use Remy as the mascot. He is a loveable character who does not get the exposure of other characters, and he fits perfectly with the Epcot Food & Wine Festival. Anyone who has ever run a large event knows that unexpected problems happen, that is just to be expected and dealt with. In this case, runDisney had to pull all of the 10K commemorative merchandise because the word “inaugural” was misspelled. 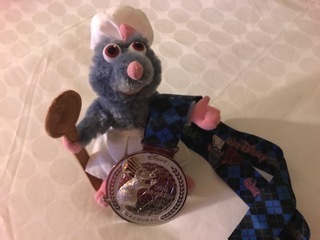 I am not going to beat up runDisney for this one, but it would have been nice had they given people notice that the merchandise had been pulled as I saw several guests searching fruitlessly for 10k merch that was not there. I loved the artwork and graphics for this year’s event. Let me rephrase, I LOVED it! The runDisney graphics team really hit it out of the park with this year’s items, I wish they sold prints, I would have bought one in a heartbeat. This part of the runDisney expos really must change. The Black Friday atmosphere of event merch is beyond unacceptable, it really has crossed over into intolerable. Before and after every runDisney event this topic is discussed heavily in running groups online, so runDisney is certainly aware of it. Yet, inexplicably, they do not address it. They do not publicly assure their customers that there will be plenty of event merchandise regardless of when they attend the expo (and history teaches us that this is often not the case with certain items). Thus there are huge lines at the opening of every expo (which is why we waited to go until Day 2). They do not allow pre-orders of the merchandise, which would reduce the chaos. And, if anything, they have made it worse by waiting longer and longer to release the information regarding what event-specific merchandise will be available via their social media platforms. This is one area that runDisney can and should address before WDW Marathon Weekend. I continue to love the change from Marathon Photo to Disney Photopass on the race courses. I take and enjoy more photos than I ever did before and I have, for the most part, been quite pleased by the quality of the photos. Anecdotally, it appears that Photopass speeds up the character lines as fewer runners need to hand off phones to cast members to take pictures. The only suggestion I would make is to make even more photo locations available at non-character spots on the course. For instance, there was a great picture stop at France during the 10K, they even had props, but there was no photographer present. Keep up the good work on this aspect runDisney! This one is the vein of a friendly suggestion. 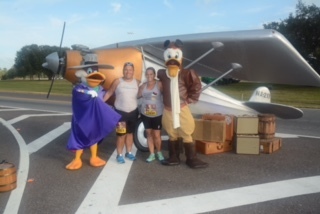 The Half Marathon was the first time that I stopped for every character and photo stop during a runDisney race, and we had a blast doing it. I enjoyed the variety of characters, especially the rarer ones like Launchpad McQuack and Darkwing Duck. However, the way they were staged often led to lengthy character break switch-outs (long walks to go behind trees, etc.) which led to long waits. Speeding up the character switch times by placing their rest areas would be a welcomed improvement. Additionally, for some reason, runDisney packed character stops into Animal Kingdom and Epcot, the 2 parts of this course that did not need any enhancements. They would be much better appreciated during the long stretches of highway running. I also find myself confused by character appearances at the expo. Several runners were able get pictures with Lumiere at the expo. However, he was not there when we were there and there were no published times for his appearances, thus runners could not plan accordingly. These photo ops are great additions to the expo and should be made known to runners in advance. I honestly do not have anything good to say about the course designs for the 10K and Half Marathon events. The 10k is essentially a retread of the Minnie Mouse 10k and the Enchanted 10k courses, which many runners will run again in the coming months. The half marathon course was just awful. While running inside the parks is the highlight of any runDisney Course Design, the in-park sections were too small of a percentage of a 13.1 mile course. (Please go back and see my article on When Course Design Goes Wrong). There are 2 other areas of note in the Half Marathon course. First, why would you put a water stop in the stench of the sewage treatment plant? The smell was so bad I found it hard to swallow my Powerade (and no, this is not an exaggeration). I honestly felt bad for the volunteers who had to stand there all morning. Second, there were unnecessary turnarounds in the Half Marathon, the first of which was accentuated by heavy congestion as the course was released to 1 lane in each direction on the down and back. The only positive of this latter aspect was that a timing mat was placed at the turnaround to discourage course cutting. But, in the end, when the highlight of your race is a mid-race shopping adventure, you know it is not a good race. On an unrelated note, we learned that Cheetos may be the greatest in-race food EVER. This one just defies logic. 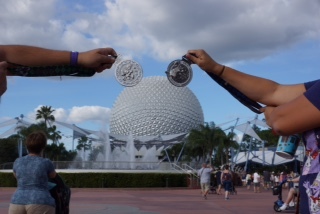 As a part of our Half Marathon race entries we received a $15 Disney gift card and a ticket to the post-race party. The gift cards were emailed to us, but runDisney created unnecessary confusion as they did not send them all at once. Instead, they sent them out in waves – my brother and I received our emails several days apart. It was also confusing as to how we could redeem these gift cards, so I just deposited ours into our Disney Vacation Account rather than figuring it out. Either mailing physical gift cards or including them in our race packets at bib pickup would have been preferable. Conversely, runDisney MAILED us our post-race party tickets. The problem with this was our tickets did not arrive at our houses until after we had already left for Florida. While runDisney did provide us with replacements, this forced us to stand in yet another long line at the expo (I noted the line several times on Day 2 of the expo and it was never less than 50-75 people). I am already on the record as not being a fan of doing away with the printed race programs. Due to the complex logistics, transportation, and times involved, runDisney race weekends are some of the only events where I pour over the pre-race instructions. Going to the electronic event guide is obviously a cost-cutting measure, but it is an overall negative for runners. While it looks slick, I found this online version of the guide to be clunky at best, and it had incorrect information (which, despite being electronic, was never corrected). Additionally, the mobile version of the runDisney website is pretty bad, and most people looking for information during a race weekend will be accessing the site through their smartphones, which only compounds the problem. In short, please bring back the printed race weekend information or at least a condensed version of it! When we finished previous Wine and Dine Half Marathons, smiling volunteers greeted us with a choice of wine or beer. It was great. This year, we got nuthin’. I am not saying this is a make or break, but it was disappointing and it did not go unnoticed. 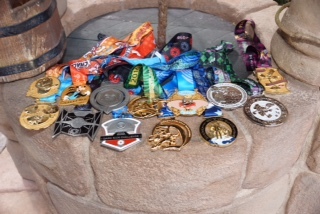 I sound like a broken record, but one area where runDisney continues to excel is with race Medals. 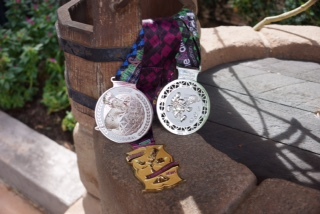 I cannot say enough about the designs of this year’s medals. 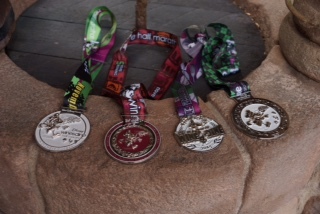 I was proud to earn them, proud to wear them around the theme parks, and will be proud to display them on my bling rack. It seems like every WDW race weekend, runDisney is getting better and better at handling race day transportation (with the exception of some issues at Star Wars Dark Side, but we’ll cut them slack on that one since it was a new event). Seriously, we found the event transportation to be plentiful and efficient. We never did wait for a bus, they just kept cycling them through. Props to the transportation team for a job well done. I know it sounds like I am being negative about this event, and, to be honest, I am. This went from being my favorite race weekend of the year to being one that I am doubtful I will run again. As you can tell, a lot of the problems arise directly out of moving the half marathon from a night to a day race and from a bad course design. While I liked the addition of a a 10K event, overall, I was not satisfied with this event. The point of these Final Thoughts is two-fold. First, we want our readers to have an unvarnished look at our impressions so they can make informed decisions as to what races to enter. Second, we hope runDisney and other race directors will take this feedback in the constructive nature in which it is intended to improve upon these events for future enjoyment. So, the jury is out and the ball is in runDisney’s court.